It’s been decades since Michael Myers (James Jude Courtney, Nick Castle) reign of terror on Halloween nearly took the life of Laurie Strode (Jamie Lee Curtis). Now, 40 years later to the day, he’s back to terrorize the residents of Haddonfield; but, in Michael’s absence, Laurie has been plotting a revenge of her own to protect her Daughter and Granddaughter (Judy Greer, Andi Matichak). Will her preparations be enough to stop this breed of pure evil? 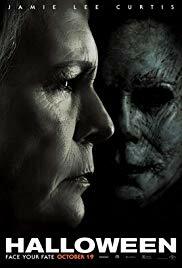 Directed by David Gordon Green and written by Green, Danny McBride, and Jeff Fradley, this true to original form and intent reincarnation of the Halloween franchise is packed with heavy doses of its creators DNA, paying love and homage to the first few sequels (A.K.A. The Debra Hill and John Carpenter era) and dismissing the latter 36 years of mediocrity, this is a good thing. The film follows the basic and traditional rules of horror and suspense to make for a squirm in your seat good time, especially for those with a passion for schadenfreude and those who view film as a lens or mirror to reflect our current social culture, oh, this can’t end well. On the whole, the ensemble hits the tone just right and Lee Curtis finishes strong to bring this monster into the barn, so to speak. And, while the splatter level to the film isn’t the highest per-se, it’s also not entirely necessary to drive its point. You’re in for a dark ride of nostalgia and stabbyness in a traditionally compact hour and forty five minute run time. You know you want to….. Halloween is rated R.